Deivid Silva (BRA) was unstoppable on Sunday as he defeated Marco Fernandez (BRA) by a score of 17.77 to 14.40 to win the 2017 WSL Men’s QS 1,500 South to South presents Itacaré Surf & Sound Festival at Praia da Tiririca in Bahia, Brazil. Silva was in top-form throughout the competition and saved his best performance for last by scoring a 9.60 and an 8.17 in the Final by executing vertical attacks on the windswept waves in the 3-ft. range (1 meter). Silva wasn’t even supposed to be at the event, but opted to go on a last-minute decision. Having registered for the event as a late entry, Silva was not able to use his Qualifying Series ranking seeding and was placed in Heat of Round 1 instead of directly into Round 3 with the other top seeds. But the combination of his speed, precise airs and powerful carves carried him from the first heat of the event to the last and most important one for the victory. The punchy waves at Praia da Tiririca worked in Silva’s favor as he was able to show his full range of surfing during the event. Marcos Fernandez was the only surfer from Bahia that made it to the Quarterfinals. Despite having the full support of the crowd at Praia da Tiririca, Fernandez was unable to triumph over Silva’s explosive performance. In what could easily have passed as a Final, Deivid Silva faced Alejo Muniz (BRA) in Heat 1 of the Semifinals. Muniz had been impressing the judges with his fast and clean rail-to-rail surfing, but could not come up with an answer as he was defeated by Silva by a score of 16.04 to 13.60 respectively. In Heat 2 of the Semifinals, Fernandez was matched up against Krystian Kymerson (BRA), who had been on a tear all event long getting high-scores in every heat with his impeccable aerial talent. However, Fernandez got off to a strong start by blowing apart two righthanders at the beginning of the heat for a 15.94 total (7.77+8.17). Kymerson fought back but could not obtain anything beyond mid-range scores, bowing out of the event with a 9.34 total. With his result today, Kymerson jumped from 8th to 2nd place on the WSL South America Ranking. The continental title will be determined next week in Maresias at the final event of the year before heading to Hawaii. Thiago Camarão (BRA) currently leads the rankings, but there are an additional 14 athletes that are mathematically capable of becoming the 2017 WSL South America Regional Champion. The winner from each WSL Region will gain automatic entry into all QS 10,000 and QS 6,000 events in 2018. 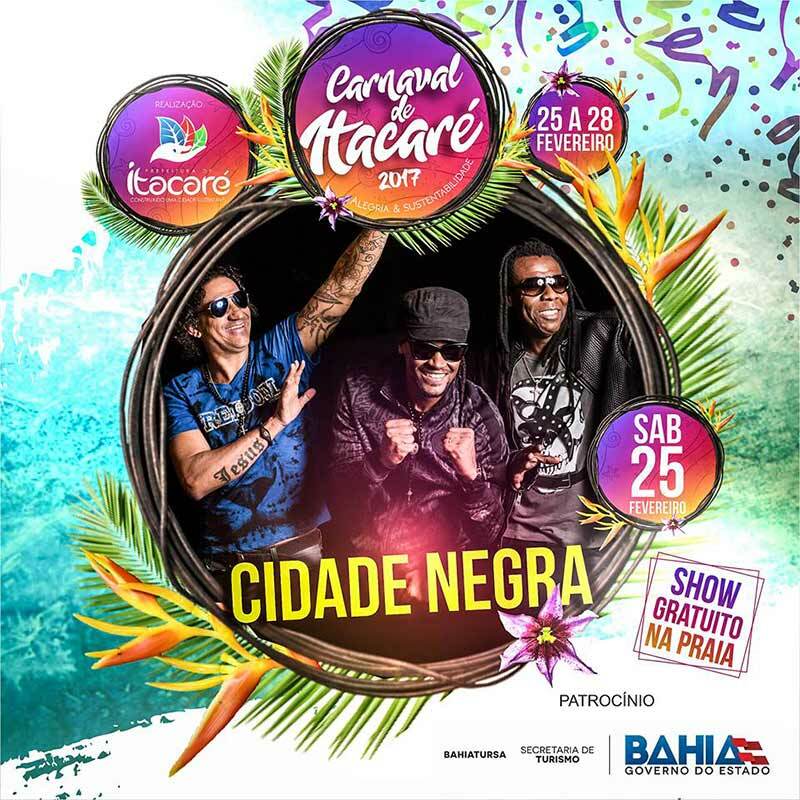 Icon of the 90’s, the Brazilian Reggae group Cidade Negra opens the Carnival in Itacaré. Toni Garrido, Bino Farias and Lazão perform on the main stage on February 25 (Saturday) and will provide a special repertoire, full of hits, as well as new features. With the theme “Joy and Sustainability”, the Itacaré carnival will be held from February 25 to 28. There will be two trios elétricos during the day, about seven blocks and cultural manifestations in town, and two stages mounted on Castro Alves Avenue for the main concerts. The Gastronomic Festival “Sabores de Itacaré” invites everyone to know a little more about the diversity and gastronomic quality of Itacaré. The event takes place from December 1 to 17. 40 restaurants participate in the festival. Seventeen days with public performances by the best local chefs and a cultural program with popular music. On Sunday, Kanoa Igarashi (USA), 18, achieved the most important accomplishments in his career so far as he confirmed his qualification onto the 2016 World Surf League Championship Tour after defeating Connor O’Leary (AUS), 22, in the Final of the QS 6,000 Mahalo Surf Eco Festival held at Praia da Tiririca, in Itacaré, Brazil. Kanoa got off to a quick start during the Final by throwing a straight frontside air on a right at Praia da Tiririca that gave him a 7.00 on his first ride. He then followed with another ride where he executed several strong frontside hacks for a 6.17. O’Leary chose to be patient and his strategy paid off as he earned a 7.77 on his first scoring opportunity, then added a 5.93 for a 13.70 heat total and the lead over Igarashi. O’Leary extended his lead when he displayed a series of vicious backhand hacks on a right which merited a 6.97 for his backup score. With only three minutes remaining in the Final, Igarashi scratched into a righthander and reached an incredible speed before chucking a huge full rotation reverse to take the lead with a 7.40. In the dying seconds, with O’Leary needing a 7.20, Igarashi caught another right, threw two air reverses on the same wave and sealed his victory with a 7.57; the final score being 14.74 to 14.40 respectively. Despite not winning the Mahalo Surf Eco Festival, O’Leary was pleased with his performance in Itacaré. In addition to establishing the highest heat total (18.44) and the highest single wave score of the event (9.57), the young Australian also climbed into the list of Top 10 surfers that are eligible for qualification onto the elite division of competitive surfing, the Championship Tour (CT). Competition on Sunday began with Igarashi facing up against Ryan Callinan (AUS) in Heat 1 of the Semifinals. Although Callinan had an 8.83 on his highest scoring ride, his low scoring 2nd ride was not enough to overtake the Californian and was defeated by a score of 14.83 to 13.16. In Heat 2 of the Semifinals, O’Leary was matched against the lone Brazilian left in competition, David do Carmo (BRA). Both surfers were neck and neck throughout the heat as they kept busy and produced several mid-range scores. Do Carmo had a chance to take the win on his last wave, but O’Leary held on to a slim lead and advanced by a score of 12.97 to 12.70. With a 3rd place finish, David do Carmo obtained his best result this year on the Qualifying Series. After the QS 6,000 Red Nose Pro in Florianopolis and the QS 6,000 in Itacaré, the third and final event of the WSL South America Surf Series will take place from Nov 2-8 at Praia de Maresias for the Oi HD Sao Paulo Open of Surfing QS 10,000. Top surfers on the CT looking to requalify and the best surfers on the QS will battle it out as U$250,000 in prize money will be distributed and crucial ranking points will be up for grabs before heading to Hawaii for the final events of the 2015 Surfing Season. The lush tropical beach of Praia da Tiririca provided the back drop for Day 5 of the Mahalo Surf Eco Festival in Itacaré, Bahia. Sunny skies and waves in the 2-3 foot range (1 meter) were on hand as Rounds 4 and 5, in addition to the Quarterfinals were all completed on Saturday at the QS 6000. Connor O’Leary (AUS) has been outstanding in his recent heats and has continued to post high scores in the excellent range. Facing up against Michael Wright (AUS) in Heat 7 of Round 5, O’Leary linked together three vertical snaps in the pocket on a righthander to earn the highest single wave score of the event, a blistering 9.57 (out of a possible 10 points). Wright followed with an 8.93 and a 7.77 for a 16.70 total. But O’Leary could not be outshined after collecting an 8.87 (even discarding an 8.50) for the highest heat total of the event as well, an 18.44. After defeating Wright, O’Leary maintained his lofty strike-rate and went on to overcome Beyrick De Vries (ZAF) in the Quarterfinals with a 9.07 and an 8.83 (17.90) against the 12.10 totaled by the South African. With his result today, O’Leary took control of 10th place on the QS rankings and is currently eligible for qualification onto the 2016 Championship Tour. O’Leary remained modest when asked about his accomplishment. O’Leary will now face the only Brazilian surfer still left in competition at the Mahalo Surf Eco Festival, David do Carmo (BRA), who defeated Noe Mar McGonagle in Heat 3 of the Quarterfinals by a score of 12.90 to 11.90 respectively. On the other side of the heat draw, Heat 1 of the Semifinals will see the two highest ranked surfers on the QS still alive at the Mahalo Surf Eco Festival face off against each other. Ryan Callinan (AUS) is currently in 7th place on the 2015 Qualifying Series, while Kanoa Igarashi (USA) sits in 6th and needs to win at Praia da Tiririca to obtain 23,350 points and guarantee his promotion to the CT next year. Callinan began the day by beating Bruno Galini (BRA) in Round 5 by a score of 11.67 to 9.73, then defeated fellow countryman Soli Bailey (AUS) with a solid score of 15.24 to 13.17 in Heat 1 of the Quarterfinals. In Heat 4 of Round 5, Igarashi, the young surfer from California, merited high scores from the judges after demolishing the righthanders at Praia da Tiririca for an 8.90 and an 8.73 (17.63), eliminating Ramzi Boukhiam (MAR) who obtained a 14.74 heat total. Then in Heat 2 of the Quarterfinals, Igarashi defeated Santiago Muniz (ARG) by a score of 15.50 to 12.47 respectively. A call is set for 8 am local time on Sunday for completion of the WSL Men’s QS 6000 Mahalo Surf Eco Festival. A total of U$150,000 in prize money will be distributed. The winner will take home U$25,000 and 6,000 points that are valid towards their 2015 Qualifying Series ranking. Friday began with torrential rain at Praia da Tiririca and forced Event Organizers to put competition on hold at the 2015 Mahalo Surf Eco Festival. Yet as is the case in tropical regions, the sun shortly returned and the action continued at the WSL Men’s QS 6000 event in Bahia, Brazil. Bruno Galini (BRA) once again kicked off the excitement with a victory as he earned a 16.07 after opening up with an 8.50 and subsequently backed it up with a 7.57 on his two best scoring rides. Galini was able to defeat a stacked line-up of opponents as he dispatched Nic von Rupp (PRT) and Tanner Gudauskas (USA). Soli Bailey (AUS) moved on in 2nd place with a 12.40 total. In Heat 5 of Round 3, Jadson Andre (BRA) once again looked to pull rank over QS surfers Santiago Muniz (ARG), Kanoa Igarashi (USA) and Derek Peters (USA). Yet it was Muniz who stormed to the lead as he put together a solid heat score of 16.00, which included a 9.00 point ride. Igarashi stepped into action and jumped into second place as he maintained his steady performance in the QS events in Brazil. Igarashi later shared his perspective in regards to the Mahalo Surf Eco Festival in Itacaré. Only the Top 10 ranked surfers on the WSL Qualifying Series at the end of this year’s Surfing Season will qualify for the 2016 Championship Tour. Results at the Mahalo Surf Eco Festival QS 6000 are immensely sought after as the athletes look to solidify their place in the standings. Noe Mar McGonagle (CRI) needs to win the event to make it into the Top 10. Soli Bailey (AUS) and Dion Atkinson (AUS) need to make it to the Semifinals if they want to overcome Maxime Huscenot (FRA) who currently has 15,100 points on the QS rankings. For the remaining athletes in striking range, Evan Geiselman (USA), Davey Cathels (AUS) and Connor O’Leary (AUS) all need to make it to the Quarterfinals to be eligible for qualification. In Heat 11 of Round 3, O’Leary looked fierce on the waves in the 2-3 foot range (1 meter) and earned the highest heat total of the day, a 16.70 (8.93 + 7.77). The promising young surfer from Brazil, Yage Araujo (BRA) threw a massive air to take second place and advance into Round 4 alongside O’Leary. The intense battle for conclusive positions on the QS rankings will continue on Saturday at Praia da Tiririca. The contest is scheduled to run three rounds of competition and will determine the four Semifinalists that will compete for the title of the QS 6000 Mahalo Surf Eco Festival on Sunday.